Click here to view current Advanced Practice Nursing opportunities. NEW! Click here to learn about the Nurse Practitioner Fellowship Program in Hospital and Palliative Medicine. With the resources of a world-class academic medical center, and areas of specialty that span the complete spectrum of patient care, the University of Michigan Health System is committed to constantly advancing quality health care. As patient needs continue to evolve, so does our technology, our knowledge and our opportunity to create positive outcomes. That’s the Michigan Difference – and that’s where you come in. Our team of highly-trained Advanced Practice Nurses, Clinical Specialists and Physician Assistants work hand-in-hand supporting a superior medical team. When you join us, you’ll find more than just the advanced training, education and support you need to succeed, as you work toward advancing your skills and your career. Here, you’ll quickly discover there are unlimited opportunities to make a real impact. Incredible careers and opportunities await today’s best Advanced Practice talent at UMHS. Apply now to become part of The Michigan Difference. Clinical leaders who promote evidence-based nursing practice, function as role models and mentors, and support nursing research and quality improvement initiatives – and their application to clinical practice. The Mission of the Clinical Nurse Specialist is to advance the practice of nursing at UMHS, especially through consultation and interdisciplinary collaboration, affecting quality outcomes of care; and the promotion of development and contributions to evidence-based practice at UMHS. The Clinical Nurse Specialist provides consultation in the care of the complex patient; and collaborates with CNS colleagues and members of the healthcare team to promote excellence in nursing. Registered Nurses who have advanced education in both midwifery and nursing, offering care for women throughout their life cycle, traditionally focused on pregnancy and childbirth. The U-M Von Voigtlander Women’s Hospital’s Nurse-Midwifery Service is dedicated to providing women the best care available, using an individualized approach, minimal intervention, and ensures a woman’s full involvement in decision-making related to her care. For almost 30 years midwives have provided care for women at U-M using a holistic, woman-centered approach. Our nurse-midwives’ philosophy is to be a partner with our patients, using a high touch/low tech approach with the goal of creating an individual plan of care that best meets each patient’s unique needs. U-M’s eight certified nurse-midwives are Registered Nurses who have completed a Master’s Degree as well as a graduate midwifery education program. They are certified by the American Midwifery Certification Board, licensed by the state of Michigan and faculty members at the University of Michigan Health System. U-M nurse-midwives offer a spectrum of health care services for women. In addition to pregnancy and childbirth care, they work with women to support their gynecologic and family planning needs. Nurse-midwives work independently in the care of healthy women but they have access to the full depth of expertise at the University of Michigan Von Voigtlander Women’s Hospital should the patient require additional services. For those who may develop complications during pregnancy, our nurse-midwives work as a team with U-M’s maternal fetal medicine specialists, who are among the best in the world, to ensure our patients receive the highest-quality services available. Registered Nurses with advanced education in the administration of anesthesia, providing anesthesia and anesthesia-related care, to facilitate diagnostic, therapeutic or surgical procedures to all patients regardless of age, under the medical direction of an Anesthesiologist. 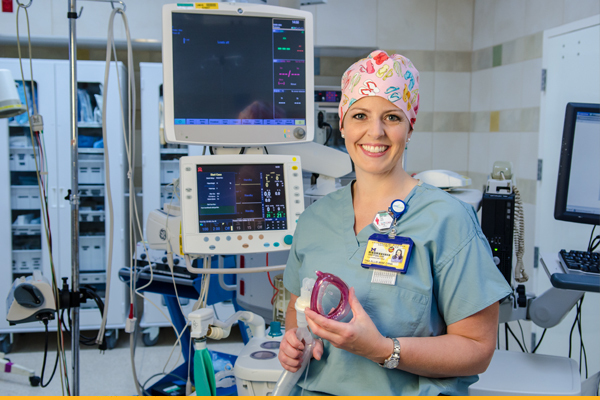 UMHS Certified Registered Nurse Anesthetists (CRNAs) develop the Anesthesia Care Plan together with the Anesthesiologist and prepare preoperative assessments including health histories and physical examinations. CRNAs initiate and maintain appropriate perioperative anesthesia care. Registered Nurses who have completed an advanced education and training in the diagnosis and management of common medical conditions, including chronic illnesses. Nurse Practitioners (NPs) at the University of Michigan Hospitals and Health Centers are committed to the UMHHC motto: “Patients and Families First” . Our goal is to help provide the best possible medical care and specialized health services to individuals, families, groups, and communities. We are dedicated to continuous quality improvement through research, peer review, performance evaluation, outcome monitoring, and ongoing education. A Nurse Practitioner is a Registered Nurse who has completed advanced education (generally a minimum of a master’s degree) and training in the diagnosis and management of common medical conditions, including chronic illnesses. Nurse Practitioners provide a broad range of health care services.